This year at the IPCPR we met up with the team from Cigar Reserve. Based out of Lake Oswego, OR, Cigar Reserve has engineered a cedar spill that is quite unique in its design. Shaped like a Spanish sword, the cedar spill burns perfectly once lit and overs the perfect and preferred method to lighting your favorite cigar. Of course you could always use a cut piece of cedar from one of your cigar boxes but as you may have experienced once lit it tends to burn a little faster than you may like. The Cigar Reserve cedar spill burns slowly and evenly to give you a perfect flame for torching up the foot of your favorite stick without scorching the delicate wrapper. Why use a cedar spill? Well the first and most important reason is that it is all natural and presents no aroma other than cedar that will affect the delicate leafs in the cigar. Cigars love cedar, we store our cigars in cedar lined humidors and manufacturers age them in cedar lined rooms and many ship them in cedar boxes. It just makes sense. If you use a match or Zippo lighter the scent of the fluid or match sulphur can get into the cigar chamber and spoil the smoking experience. Tobacco leaf is very sensitive and using torch lighters might make sense in a windy outdoor environment, but they can easily scorch and char the foot and wrapper of your cigar and that scorched flavor easily moves into the chamber and affects the taste of the cigar. So here is a short video on how to light your cigar with a Cedar Spill from Cigar Reserve. Overall we found the design of the Cigar Reserve cedar spill to be superior in design as it maintained a perfect slow burning flame and offered plenty of time to light up a cigar. 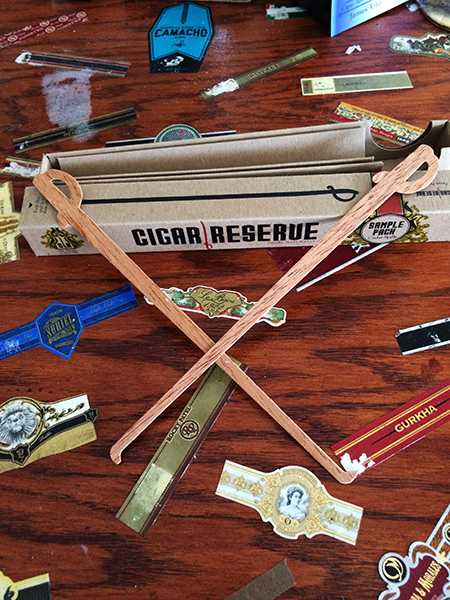 They can easily be used for more than one cigar so share the flame with your friends too. If you would like to order cedar spills from Cigar Reserve their website is www.cigarreserve.com. You can also find these at many fine cigar shops around the country and their website has a list of the those that carry them. This entry was posted in Cigar 101, Video Cigar Reviews and tagged Cedar Spills, cigar 101, Cigar Reserve, IPCPR 2015, Video Review. Bookmark the permalink.